Just about everyone loves a baked potato. And when they are twice baked they’re twice as good because they’re baked, fully loaded, with all the fixin’s. 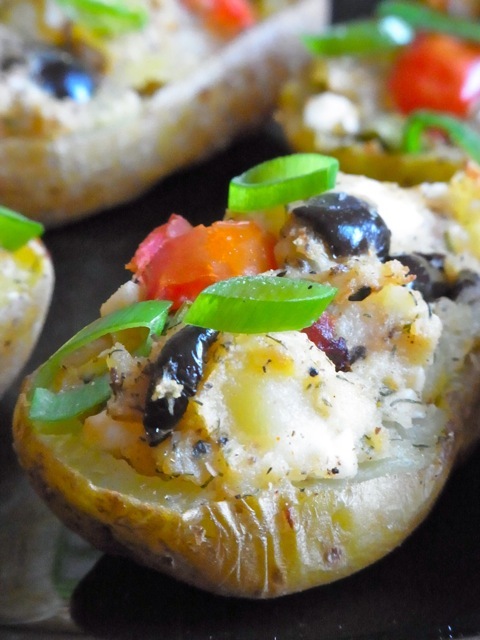 I recently had the idea of making a twice-baked potato with a few flavors mostly associated with Mediterranean cuisine. They came out so awesome that I just had to share. I decided not to use any butter for this recipe to reduce the amount of saturated fat in these potatoes. In the end, I found that I didn’t miss the butter in these potatoes because they were loaded with so many awesome flavors like sun-dried tomatoes, olives, feta cheese and lemon zest. Should you decide to bake these, use 1½ teaspoons of sea salt to start with. Depending on how salty your feta and olives are, you may need to add more after tasting. Enjoy! Using a clean fork, pierce the skins of the potatoes in several places to allow the steam to escape. Place the potatoes directly on the wire rack and bake in the center of the oven for 35-45 minutes, or until you can easily pierce the center of the potato with little resistance. Remove the potatoes from the oven and allow them to cool until they are cool enough to handle, about 10-15 minutes. Meanwhile, reduce the heat of the oven to 375 degrees. Once the potatoes are cool enough to handle, cut them in half lengthwise and scoop out the insides of the potatoes into a medium mixing bowl; leaving enough of the potato to form a ¼” thick shell (see image below). Set the shells aside. Use a potato masher to mash the potatoes to your desired consistency. I like my potatoes slightly chunky. However, you may prefer a creamier potato mix. Add the remaining ingredients to the mixing bowl and combine. Tastes and check for seasonings. Add salt if necessary. Fill the reserved potato shells with the mixture. Sprinkle with salt, pepper and additional dried oregano, if you like. Bake in the oven, uncovered, for 20 minutes or until golden brown and heated through. Serve warm or at room temperature. NOTE: You can prep these ahead of time and stop at step 6. Wrap and refrigerate the filled potatoes and bake them off right before your guest arrive.